Elephant Seal Bulls Fighting at Piedras Blancas Beach. Northern Elephant Seals (Mirounga angustirostris) are back in a big way at Piedras Blancas. The seals began colonizing this beach near San Simeon, California in 1990, and thousands now breed at this rookery from December through February each year. But the seals once faced extinction. Pursued relentlessly for their oil by hunters, their population plummeted until only one colony of fewer than a hundred seals survived. That colony was on Mexico's Guadalupe Island. The Mexican government banned hunting of the seals in 1922, and the United States later did the same. The seals now have established breeding sites from Baja California to Point Reyes. On land, elephant seals often appear awkward and lethargic. But let them dive into the ocean and they become gifted athletes, holding the depth diving record for air breathing mammals. But elephant seals aren't the only mammals to benefit from the coastal habitat at Piedras Blancas. Bobcats, brush rabbits, California ground squirrels, coyotes and black-tailed deer are also present. The California coast from Cambria to Ragged Point is also a birding hotspot. Watch for bald eagles, brown pelicans, terns, snowy plovers, sandpipers, black oystercatchers, woodpeckers, wintering hawks and songbirds. In winter months, check the pines at San Simeon State Park for overwintering Monarch butterflies. Northern elephant seals are present at Piedras Blancas year round, but their numbers are reduced during the fall haul-out. Winter (December through February) is the most interesting time to visit. Female adults return to the beach in December, and the first pups can usually be spotted by mid-month. 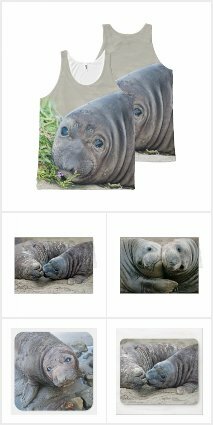 And the peak of the elephant seal mating season? At or close to Valentine's Day. Although seals may stay active on cold and cloudy days, arrive early in the morning or late in the afternoon to have the best chance of watching seal interactions on warmer days. You can chose from bed and breakfasts, motels and secluded resorts in Cambria and San Simeon. Or you can camp at Heart San Simeon State Park. San Simeon Creek Campground has 115 sites, and campers have access to flush toilets and coin-operated showers. Primitive campsites are available at Washburn Campground overlooking the Santa Lucia mountains and the Pacific Ocean. Hearst Castle, once the estate of William Randolph Hearst, is now a National Landmark and designated State Historical Monument open for public tours. Using Hearst Castle as your landmark, follow Highway 101 north for 4.4 miles to an oceanside parking lot. See current activity at the elephant seal rookery thanks to this live feed from Friends of the Elephant Seal. Northern Elephant Seal Bull. Copyright Steven Holt/soaringseal.com. Tote bag available in 3 sizes.